Today’s feature on back-country trout surveying comes to us from Nebraska Game and Parks. Sometimes, if you want to get where the fish are, you have to go where other people are not. Such was the case for fisheries biologists in the Pine Ridge last week, as they recruited the help of a Game and Parks Commissioner, a Wyoming outfitter, and six four-legged friends to study one of Nebraska’s most remote public fishing areas. With the help of horses and mules owned by Commissioner Rick Brandt of Roca and outfitter Casey Cary of Powell, Wyoming, fisheries staff members Al Hanson and Joe Rydell of Alliance administered a rare sampling of the south fork of Soldier Creek. The cold-water brook is one of three branches of the stream coursing through the Soldier Creek Wilderness Area before it merges to one and flows eastward to Fort Robinson State Park. Similar to biologists throughout the state this spring, Hanson and Rydell have been persistently surveying fish populations, usually using trucks and motorboats to set and retrieve nets. The samplings help them make determinations about fisheries, such as populations, size and health of the various species swimming throughout the Panhandle. 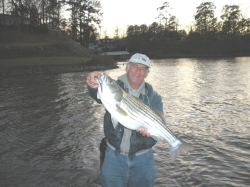 The Commission uses the information to make management decisions and advise anglers of the best fishing spots. The biologists use a little different approach for cold-water streams, employing electroshocking equipment to stun fish, slowing them down just enough to be netted for study and then released. Many trout streams in Nebraska may be remote, but most of them are accessible by vehicle at least to some extent. Because of wilderness area regulations, surveying the headwaters of Soldier Creek’s south fork is a little more challenging. Wilderness areas, each of which are managed by one of four federal land management agencies (in this case, the U.S. Forest Service), have special rules to limit negative impacts from humans and ensure their preservation. The rules allow for no mechanized vehicles, including bicycles, game carts or even trucks driven by fisheries biologists. Horses, however, are permitted, and, for this fisheries project, hooves would have to be involved. The survey party of four, along with this writer-photographer, rode on the backs of Brandt and Cary’s horses and mules for the seven-mile round trip while a packhorse carried the survey equipment. Included in the panniers and strapped to the saddle were long-handled nets and the electroshocking backpack unit with its wands. The unit, which looks similar to a metal detector, sends a non-lethal charge through nearby surrounding water. Because of his past ventures by mule, Brandt was in familiar territory as the crew made its way up the creek. The avid horseman who owns a Lincoln excavation company was selected to the Commission’s board last year with a reputation for supporting big game conservation efforts, most notably Nebraska’s bighorn sheep program. He is one of the founding members of the Nebraska Big Game Society, which has provided financial support for many of the Commission’s conservation efforts for wild sheep, elk and mule deer. At least twice a year Brandt rides the northwestern Nebraska backcountry to catch sight of big rams and other Nebraska wildlife. During those trips, he often also takes a gander in the creeks to see what is swimming in their clear waters. This far up the creek, things are usually pretty quiet. Although a glitch in the backpack unit deterred Hanson and Rydell from surveying as much of the creek as they had planned, they were able to learn plenty. In addition to nice fish, they saw some nice scenery in a landscape painted green with spring rains. With occasional sandstone cliffs, ponderosa pine trees and a variety of hardwoods towering above, the south fork meanders over a bed of stones with areas of shallow rapids between deeper slower-moving pools. It’s an advantageous situation if you’re a trout. “This is some of our best rubble in the Pine Ridge,” Hanson said, as he watched fish dart through the clear water flowing over well-worn rocks at the creek’s headwaters. Hanson, a longtime employee of the Commission and now fisheries supervisor for the northwest district, has familiarity with the upper third of the south fork, even if he does not get there as often as he would like to. He remembers using a horse and coolers to pack in fingerling brook trout to the upper end of the south fork in the 1980s and again in 1993. The latter stocking followed the flood of 1991, in which thunderstorm deluged the area with 12 inches of rain and was suspected to be detrimental for the brook trout population. From last week’s observations, it appears the trout are naturally reproducing in the creek and doing well. The upper end of the south fork of Soldier Creek may not be the easiest place to access, but few who have been there regret the journey – especially those who get there with the help of some hooves. This entry was posted in Conservation, Trout and Salmon on June 13, 2017 by ronniegarrison.